It’s always been said that time is money, and time can only truly be measured with a good quality watch. However, watches don’t only tell the time; they define who you are by making a statement on your behalf. Hence when purchasing one, it’s best to keep in mind that one size doesn’t fit all. This is why many of the leading watch brands have created variations of their famous timepieces to suit the needs of all customers, and Hamilton is no exception. As a leading watchmaker with its roots in the States, Hamilton is known to design some of the most sought after elegant pieces linked to America’s heritage. Below are 20 of their best Hamilton watches on the market. 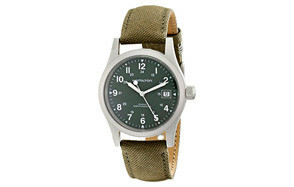 Although the Hamilton Unisex Khaki Field Watch and the men’s khaki watch are members of the same family, they have vastly different traits. Whereas the men’s field watch evokes a classic and contemporary look, this unisex timepiece from Hamilton offers a more handsome yet ruggedly appeal. This unisex field watch comes in a round casing made from stainless steel, and a sapphire crystal window just like its partner the men’s field watch, making it challenging to develop scratches, no matter which part of the wilderness you move deep into. With a green dial face that displays 24-hour military time tracking in Arabic numerals, this watch is easily adjustable for all users, be it men or women, thanks to its leather-trimmed, green canvas strap. So go ahead on that outdoor adventure you have been planning and benefit from its many Swiss-made features of this watch. With even just a quick glance at the Hamilton Men’s Khaki Field watch, it is evident it has been carefully crafted for the ‘classic man’. Made with black calfskin and an analog display, this men’s watch is one that fulfills all the requirements of the modern man who has a deep love for all things old-school. Made in the USA, this stainless steel machine is water resistant at 50 meters, and thus, it can be used while swimming and snorkeling. Overall, the men’s khaki field watch is an all-around timepiece worth owning – it’s comfortable on the hands, straightforward to use, and you get to look extra dapper while you let the world know what time it is. Be sure to also check out our list of the best rose gold watches for more great items like this. Hamilton believes in creating pieces that are true to themselves, their wearers and the Hamilton brands, no matter how different they look. The Hamilton Intra-Matic Silver Dial Leather Men’s Watch fits the bill (with a little change) with their well noted classic black leather straps that blend in well with its Swiss-made watch label. With its automatic movement, this all American, water-resistant watch comes with a 42-hour power reserve. The Intra-Matic silver dial is stainless steel, casual style timepiece that all men will fall for easily. Our handy guide to the best survival watches features more great products like this. Do you want to remain timelessly stylish? Looking for a watch that has all the classic charms? If so, the Hamilton Men’s Khaki King II Black Dial Watch offers a unique mechanical approach that makes a statement with its stainless steel link bracelet attached to its housing. 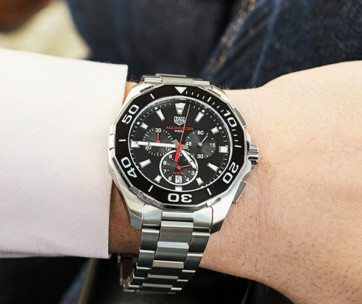 Just like the silver dial men’s watch, the King II allows you to swim in water up to 50 meters. Never lose your watch by using its double-push, fold-over-clasp, that comes with a safety button. Your wrist will never look as good as it does in Hamilton’s textured steel number. Love this product? Check out our review of the best solar powered watches for our top picks. Say hello to the Hamilton Men’s Khaki Field Black Dial Watch, a fantastic brown leather piece that comes with the added touch of contrast stitching and a fixed bezel made with stainless steel. Now there is no need to freeze when you accidentally drop your watch as this timepiece from Hamilton comes with a scratch-resistant sapphire crystal and skeletal case back that will keep all scratches and cracks away every time. The field black dial watch offers an analog display with the regular seconds, minutes and hours functions, with all dates displayed at the 3 o’clock position. Just like Hamilton’s unisex field watch, you can take this watch into the water and have a splashing time! Find more great products like this by checking out our guide to the best golf GPS watches. Looking for the perfect gift for your father, brother or son? Or are you simply looking to treat yourself? If so, the open heart watch from Hamilton is the most amazing men’s gift you can purchase for any occasion! Crafted with a partially open center that has been brushed silver, the hour and minute hands of this attractive watch have been treated to appear lighter, making it easier to read the time at any point in time. Go on and get him that irresistible gift! For more similar watches check out our guide to the top skeleton watches. Blending the rugged nature of the Hamilton Khaki line with terrific craftsmanship, the Khaki Field Analog Display Automatic is a classic piece from America’s most respected watch brand. It is a great analog, time telling machine made predominantly from stainless steel. Darkness has nothing on your time telling superpower with this watch’s luminescent hands and markers. This watch features a vintage black dial with Arabic numeral hour markers and silver-tone hands. Make sure you also check our review of Citizen watches. The Hamilton Field Day Date Black Automatic Watch is designed for those men that are sophisticated at heart and in the body. It exhibits a friendly user-display via its 6 o’clock calendar position and newly developed red-tipped second-hand markers. The striking thing about this timepiece that watch-lovers rave about the most is its exhibition case back; a remarkable feature that enables all wearers to catch a view of how the automatic watch works. Aside from this viewmatic feature and its general design details, the Khaki Field Day Date watch secures comfortably on any wrist with help from its black, textile strap and buckle closure. Every watch lover would love this as an addition to their collection, and so should you. If you like the black color, make sure you check our all-black watches review. Generate cunning designs with the Hamilton™ Khaki X-Wind GMT Aviator Watch. In a Hamilton world, the X-Wing watch is a breath of fresh air (pun intended). This Swiss made timepiece is for the cunning and the sneaky, and those who love to have fun. With three sub-dials and a luminous three-hand analog display, the X-Wind watch from Hamilton can make you forget your name and remember your time of purchase. Control how snug it fits by adjusting the branded strap of this watch and appreciate its sapphire crystal scratch-resistant design. With Hamilton watches, two things are assured; style and functionality. For more similar options, check out our Michael Kors watches guide. With a proven reputation around the world, Hamilton Men’s Jazzmaster Seaview Black Chronograph Dial Watch ensures the provision of reliable yet elegant watches for all consumers around the world. The Jazzmaster dial watch has established itself as one of their best, with its screw-in case back and polished casing made from stainless steel. With silver luminescent hands and an Arabic numeral marker, this timepiece comes attached with a stainless steel bracelet for that promised touch of elegance no matter how and when it’s worn. With a 100-meter water resistance level, the Jazzmaster also exhibits a terrific Swiss quartz movement, that sets the tone for many other competing watch brands. For more watches with the similar features, check out our list of chronograph watches. The first, most exciting feature about the Hamilton Men’s Khaki Pilot Silver Day Date Dial Watch is its high water resistance. Unlike Hamilton’s Khaki Field watch which allows for use only when swimming and snorkeling, this terrific timepiece can be used to scuba dive! Get a load of the fantastic time telling machine devoted to accurate timekeeping. This brown leather strap watch comes with contrasting white stitching within a clean, stainless steel casing. Hard to scratch thanks to Hamilton’s trademark sapphire crystal screw-in case back, the khaki pilot uses the Swiss quartz movement for its operation, and it’s in general, a styling innovation to behold. A perfect dive watch! 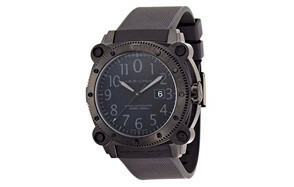 The Hamilton Khaki Navy Black Dial Men’s Watch is similar to the Khaki Pilot regarding its high resistance to water; with this watch, you can undertake any professional marine activity. Anything that involves extreme exposure to water is allowed with this watch because as the names say, it’s been designed for the navy! Another great feature of this timepiece is its self-winding automatic movement, the daily flow of your arm powers that. If you’re a lover of the environment, this eco-friendly time telling machine is your next best friend. If you want more waterproof options, check out our waterproof watches guide. When Hamilton features both scuba and navy meets in a single entity, you know the watch is bound for greatness. The new Hamilton Khaki Navy Scuba Men’s Watch is a timepiece ideal for any space with moisture, be it the pool or the beachside. 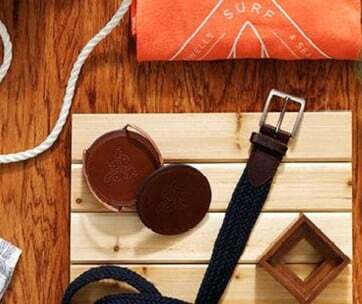 Make a grand splash in style with this watch that is loved by many surfers, mariners and beach lovers, because of its high water resistance. If you’re not into timing your swim, grab an even tan thanks to this great watch, helping you keep your cool even when your skin gets a degree hotter. Don’t forget to also check our guide to best Timex watches. This watch has been in the 1951 blockbuster, The Hamilton Men’s Khaki Navy Frogmen and was developed specially for the US naval ‘frogmen.’ Judging from its target market, its waterproof nature comes as no surprise to all Hamilton watch enthusiasts. Enjoy your oceanic dive with Hamilton’s Frogman, the timepiece that comes in a stainless steel casing, along with a three-link bracelet. Watch with wonder as your wrists attach themselves effortlessly to this watch via its fold-over clasp closure that has a dual push-button release system. With the fabulous khaki navy frogman watch, your aquatic adventures will never be the same again. Similar looking watches can be found in our Titanium watches review. The Hamilton Aviation Black Dial SS Olive Leather Watch is designed for those nights when you want to dress all the way up. With a classic date display found between 4 and 5 o’clock, the aviation timepiece from Hamilton tells time in style, in natural light, and stark darkness. This watch, unlike many others from Hamilton, has only the 3, 6, 9 and 12 o’clock positions represented in Arabic numerals, on a black luminous dial. Be on time always with this automatically operated watch and get your style game at its peak regularly. If you love minimal, then check out our review of best minimalist watches. With its Swiss automatic movement and a power reserve of up to 46 hours, the Hamilton Men’s Navy BelowZero Watch is the perfect watch from one of the leading watchmaking brands in the world. This timepiece comes with a black rubber, in addition to a black polished stainless steel bracelet. To change between the bands with ease, Hamilton includes a special tool and an escape for excess pressure on the left side of the round casing. Improve your swimming and diving skills with this champion by your side, resisting water at 1000 meters, and look like a champion yourself while doing it. Our guide to the top gold watches offers more great timepieces to choose from. Apart from all the terrific attributes, Hamilton advertises about the Hamilton Men’s Khaki Aviation Automatic Stainless Steel Watch, it has many others that make it the most loved timepiece of all time. Intricately designed, this watch does what most watches, often expensive too, fail to do; it provides a precise time that can be read at a quick glance. All hands have been sized and skeletonized to perfection to make time interpretation comfortable and enjoyable experience for every user. Be sure to also check out our list of the best front pocket watches for more great items like this. A fantastic and luxurious watch by design, the Hamilton Ventura Men’s Elvis80 Watch is a joy to wear daily, thanks to its comfortable, high quality, black rubber strap, which together with the watch case, adds to the uni-body form. As compared to its earlier version, the Elvis 75, this watch exhibits a smoother frame. It is a well-balanced design that shows a modern, sporty style with an added touch of the classic Ventura shape. The Ventura timepiece comes with a date function which unlike watches without, increases its utility for many watch lovers and enthusiasts. This stainless steel made, automatic dial men’s watch comes with luminescent hands and markers for legibility all day long. It’s unique casing also makes it an ideal gift idea for you or any man in your life. Our guide to best Invicta watches also offers more great products like this. This retro style timepiece will get you nostalgic about all those days you eagerly wanted to have a feel of your father’s watch on your wrists. Unlike many watch designs in recent times, the Hamilton Intra-Matic Silver Dial SS is a watch that receives immense attention without any form of complications. With its high water resistance and automatic operations, this watch is an excellent reminder of simpler times and is an absolute joy to wear. Find more great products like this by checking out our guide to the best Rado watches. Water Resistance to 50 meters/ 165 feet. Enjoy luminous markers and hands, enclosed in a round black dial of classic timepiece goodness from Hamilton. 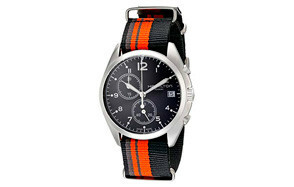 The Hamilton Men’s Khaki Aviation Stainless Steel Watch comes with a trademark band, made from striped canvas with buckle closure for a firm hold. Own your watch with prestige on land and under the sea, and watch it function at its absolute best both times; this watch is a classic!